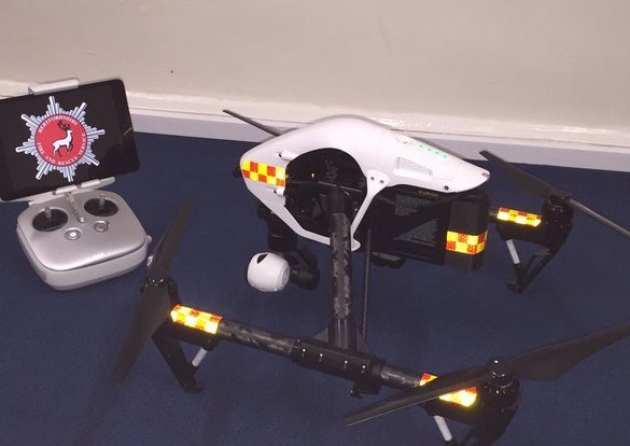 Drones are the latest in new technology to join the frontline of policing in Bedfordshire, Cambridgeshire and Hertfordshire following a successful trial of the intuitive devices. The tri-force policing alliance carried out a nine-month trial and trained officers in the use of Unmanned Aerial Vehicle (UAVs), before introducing the operational use of UAVs in June.. The drones can be used to support operations and investigations, and to help ensure the safety of the public. The devices, which have the ability to capture high-definition video and take high-resolution photographs, can assist in the search for missing people, document crime scenes and chemical incidents, and support fatal and serious collision investigations. Across the three forces a total of 16 pilots have been trained from departments including Roads Policing and Armed Policing. The tri-force is making operational use of four drones which cost in the region of £1,000-1,200 each, and can reach speeds of up to 36 miles per hour. The drones can be flown up to a height of 400 metres and in winds of up to 25 miles per hour, but must remain within the view and control of a pilot at all times. Inspector Mark Farrant from Bedfordshire, Cambridgeshire and Hertfordshire Joint Protective Services said: “Exploring the efficiencies of new technology is key to helping us face the challenges of modern policing. The drones give us greater scope to capture evidence in real time, supporting our ultimate aim of protecting the public and fighting crime. Drone support was requested to assist in the search for occupants of a car following a serious road traffic collision on the A421 in Kempston during July. The drone also provided area security surveillance during the Royal Visit of the Duke and Duchess of Cambridge to Luton on 24 August. The Home Office has admitted spy drones could be used for surveillance.